OrbLeaf is an End-to-End integrated platform for development, deployment and execution of user specific application on different type of hardware platforms, ranging from programmable Smart Card and IoT Terminal which can be customized for different type of purposes. Imagine if you're running a service business and need a way to physicalized your service using a hardware but didn't want to involved with the hardware matter. Orb-Weaver card is a smart card which is equipped with virtual machine enabling execution (on-card execution) of user application in form of card application, the main idea of Orb-Weaver card is to enable seamless program execution between smart card and terminal through a specialized API protocol. Once application installed on card, it cannot be copied and stay resident on card waiting to be executed, the transaction protocol between card and terminal are controlled by the card application, therefore the application can be executed on any Orb-Weaver enabled terminal. Using high level programming language based on Generic Purpose Language (GPL), developer could easily write card application without needed to understand the low-level of smart card (or terminal), cloud integration allowing application to be deployed almost instantly, eliminating the need to distribute Orb-Weaver card. The main idea of Organ Studio is to create a unified development environment for our Orb-Weaver based device, therefore migrating between each device could be done in seamless way. 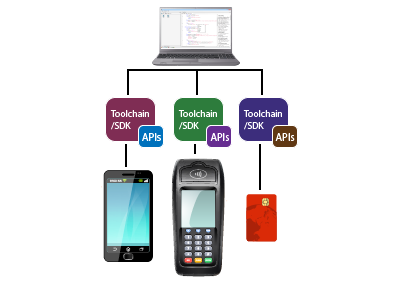 Orb-Script designed to run on constrained device such as smart card which typically have less than 1 kilobytes of user memory space, therefore it uses context oriented programming that significantly reduce memory footprints compared with object oriented programming while maintaning it advantage over conventional structural language. Orb-Script is the default Organ Development Kit (ODK) programming language, it can be used to develop application for any Orb-Weaver devices. OrbLeaf Toolkit is a set of framework written in Orb-Script language, integrated within Organ Development Kit (ODK) as online repository, the purpose of OTK is to provide a common APIs for any Orb-Weaver enabled devices, this kind of mechanism allowing an application to be re-targeted to different kind of devices with no need to port the sourcecode. Leaf is highly versatile multi-tasking operating system designed to run on constrainted resources, it provides mechanism to execute both Orb-Weaver application and native application within the same environment.  several features of Leaf such as pre-emptive scheduler (multi-tasking), exception handler, user interface, power and network management. Cardinal series terminal uses Leaf as it's operating system. Orb-Weaver Card Operating System is a revolutioner Card OS (COS), embedded within Orb-Weaver Card. 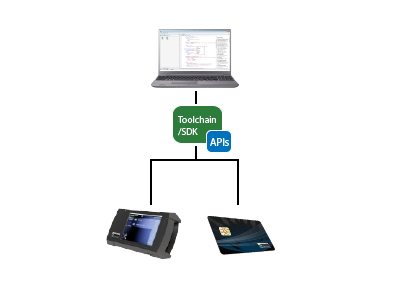 it uses ETSI 102.223 mechanism to provide mechanism to control transaction protocol between card and terminal, it provides integrated Orb-Weaver virtual machine for executing user application written in Orb-Script language, shifting the paradigm of smart card programming from slave device to active device is possible with this concept.